Villa Godoy - Torrox - Large Detached Country Villa - Sleeps 12, with Private Pool & Spectacular Views. 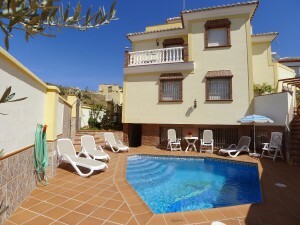 Luxury 6 bedroom detached villa just 1600m from Burriana beach. A/C Ideal for large families or groups. Modern spacious 5 bedroom air conditioned villa with private swimming pool & BBQ terrace. Detached holiday villa to sleep 10. A/C, Wifi, private pool, BBQ, sun terraces.